Discovered and patented almost 100 years ago, insulin is a critical drug for the treatment of both childhood Type I and adult onset Type II diabetes mellitus. Diabetes is a costly disease for our society in more ways than one. 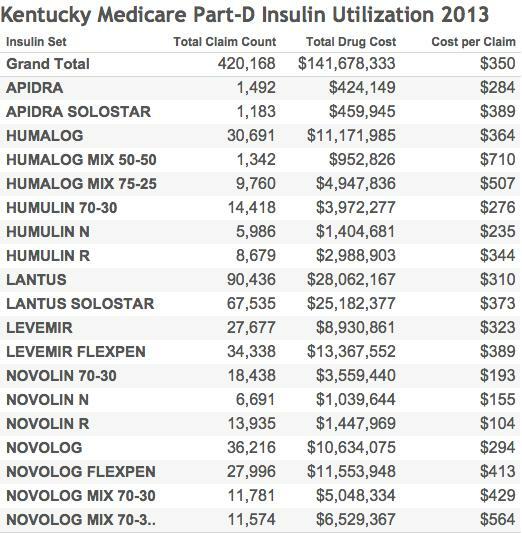 In 2015, the cost to the Kentucky Medicaid program for insulin alone annualizes to $101.8 million. Insulin consumed 9.1% of Kentucky Medicaid’s entire non-hospital drug expense while making up only 1.1% of all prescriptions. In 2013, the last year in which Medicare Part-D drug utilization data are available to me, insulin consumed 7.3% of total Medicare reimbursement for drugs in Kentucky costing a total of $141.8 million. In both federal programs, insulin consumed a larger portion of the drug budgets in Kentucky than nationally. A review of several reasons why insulin has become so expensive illustrates what is very wrong with our national drug policy. It has been a long time since I prescribed drugs for general medical problems. As a result, when I was exploring the prescription of opioids in the Medicare and Medicaid programs, I found myself having to look up the names of many of the most commonly prescribed or the most expensive drugs. One of these was Lantus, a brand of insulin which by itself was the single most expensive drug for the Kentucky Medicaid program in 2015 ($51.2 M), exceeding even the combined annualized cost of the two notoriously expensive drugs (Harvoni and Sovaldi) that are used to treat hepatitis-C ($45.4 M). This was frankly a surprise. I admit that in my former life as a house officer when I last prescribed insulin, I did not pay much attention to the price of drugs. We used insulin extracted from the pancreas of cows and pigs which I assumed at the time was relatively inexpensive. I became aware that with recombinant DNA technology that actual human insulin could be made by bacteria or yeast. That seemed like a wonderful advance and it was my understanding that the cost was the same or less than insulin obtained from animals. Even if that had been true once, it is decidedly not so now. My theory about the medical literature is that things jump out at you only when you are primed to receive them. So it was with insulin. I began to notice articles in general medical forums with titles such as: “What’s behind skyrocketing insulin prices?,” or “Diabetic cost doubles as insulin use increases,” or even, “Break up the insulin racket.” My reflexive indignation about how drugs are marketed and priced was accordingly sparked and I returned to the Medicare and Medicaid drug databases for a closer look. Where I looked and for what. The Centers for Medicare and Medicaid Services (CMS) provides in their public-use databases specific utilization and cost information about some 19 different insulins in 8 different branded families. (See useful table here from Diabetes Forecast.) Human insulins include Humuin and Novolin. The insulin analogs incude Apidra, Humalog, Lantus, Levemir, Novolog, and Toujeo. Insulins can vary within a brand by things like concentration, packaging, rapidity or duration of action, mixes of different insulins, or method of administration. I learned that my old friends, beef or pork insulin, are no longer available in the USA. The two federal programs use different definitions and categories of information and therefore cannot be combined. The programs serve very different populations but cover one third or more of Americans. The most recent data available to me are from 2013 for Medicare, and from the first three quarters of 2015 for Medicaid. Nonetheless, the observations I will offer below apply to both programs, and by inference, to non-governmental health insurers. Prices of individual named insulins. I have posted an extensive interactive set of graphics for both Kentucky Medicaid and Medicare for the reader to explore and sort as desired. 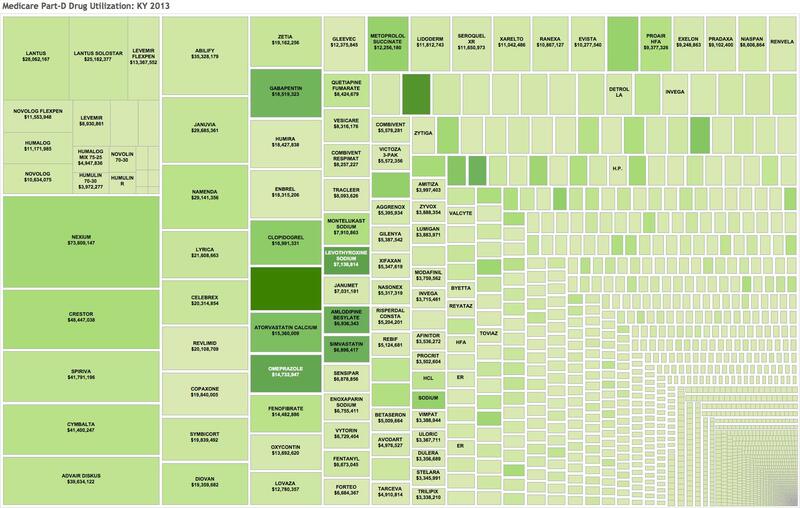 (The Medicaid data visualization is also embedded below.) In both programs, insulin as a group was more expensive than any other single drug. The various insulin types were prescribed in the same relative frequency in both programs. To my surprise, the cost per prescription for most of the same insulins was considerably higher in Kentucky’s Medicaid program than in Medicare! In Medicaid, the Cost per Unit of insulin correlated well with Cost per Prescription. Within the Medicaid program, the per-prescription price was higher in managed care than in fee-for-service (FFS) Medicaid. The big caveats here are that I do not know the quantity of insulin dispensed in a single prescription in either program, what constitutes a “unit” of insulin, or if there is a difference in the amount of insulin per-prescription in Medicaid FFS vs managed care. Drug companies can charge whatever they want, essentially unconstrained by any governmental controls or standards. What they want is a lot. Shame or embarrassment does not seem to play a role. The more they have you over a barrel, the higher the price. With the frequency of obesity and its consequent diabetes rising in the USA and world-wide, the legal drug companies must be anxious to cash in. They aren’t in business to do us any favors. Using monopoly control of an old standard or generic drug to boost its price 10-fold is a business model for the drug industry that is good for profits but bad for sick people. In other industries, legal or otherwise, this practice would be called extortion. When one insulin raises its price, arbitrarily or not, others follow. Interestingly, and perhaps showing what is possible, when faced by heavy pushback from health insurers, the manufacturers of Lantus lowered its price substantially last year. 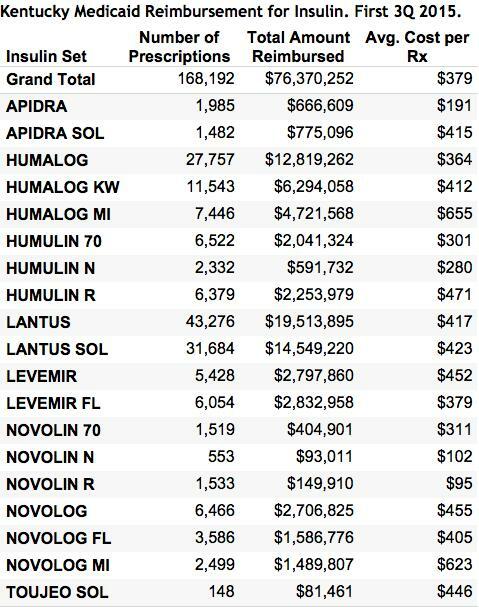 Lantus is not the most expensive of the insulins, but it is by far the most used insulin and the most costly to both programs. Is this because it is clinically much more useful than its competitors, or does this reflect successful marketing? Let’s see if others follow Lantus out of the shadows in a race to the bottom! The original patent for insulin was sold for $1 in the name of the public good. One can fairly ask why the price of insulin has not gone down over the last 50 years! Exasperating to me is the fact that you and I already “own” the genetic code for human insulin that resides in our DNA. Insulin is a protein hormone made by hijacked bacteria and yeasts using Mother Nature’s own bio-synthetic apparatus. Insulin was perhaps the first of the major “biologicals” that are as a group today the most expensive drugs on the market. Thus, the use of the term “generic” does not apply in the same way as it does for small-molecule drugs like antihistamines, anti-hypertensives, or non-steroidal anti-inflammatory drugs. In these latter chemically synthesized drugs, different brands and generics can usually be assumed, and easily demonstrated to be identical. Among the biologicals, the current term in use for alternative preparations of these large complex molecules is “bio-similar.” It reasonably cannot be assumed that one product will have exactly the same effect or be equally safe when manufactured by another company. Of course, it should not even be assumed that the same drug produced by the same manufacturer will remain identical over time. The microorganism drug mini-factories are themselves living and evolving entities sensitive to their surroundings. Re-patenting, evergreening, or incremental innovation. The usual term for a drug patent is 20 years. After that, other companies are free to make a generic version which, at least in the past, led to a large fall in price and dent in the market share of the original patent holder. What the drug industry has learned to do to keep the cash coming in is to make some minor tweak to their molecule or its delivery system that allows it to extend its patent and keep others from competing. So it is with insulin. The insulin molecule is a small protein chain of 51 amino acids strung in a chain like beads. All the expensive insulin analogs are simply human insulin with one or two additional amino acid beads added to to one end. Change the add-on bead and you have a new patentable drug! Yes the analog may have different properties than human insulin, but some differences may be clinically trivial or achieved by other methods as was the case for decades with animal insulin. Indeed, it is not yet clear to me that the analogs have been shown to be more effective than basic human insulin, nor for that matter, than newer versions of more highly purified beef or pork insulin. I will let experienced diabetologists comment further about how much any claimed putative benefit is worth. Direct advertising to the public. I was still working as a Policy Fellow in the US Senate when the law was changed to allow drug companies to advertise directly to the public. I used that opportunity to compare what the companies wanted to show the public to what they were already showing to physicians. Guess what? The ads to both in 1999 were essentially the same. There was a lot of touchy-feely stuff with butterflies hovering over flowering fields. I was impressed not with how much information was being given to potential patients, but how little of what I really would have wanted to know was being presented to physicians. There is generally little or nothing said about how a new drug compares to older effective or generic drugs. Minor statistical differences are inflated; and clinical significance, outcomes, or improvements in quality of life are rarely mentioned. That pattern persists to the present. These three promotional tools drive the market in the direction of the most expensive drugs. The most frequently voiced rejoinder from the legal drug industry is that no one has to pay the full price. It is true that, as on an airplane, no two people pay the same for their seat or their pill. This is, however, a specious defense. Just as with hospitals, uninsured people and other “self-pay” individuals (including the poor) face the full price. Higher co-pays and deductibles used to decrease employer’s costs in today’s private insurance market shifting more or even the majority of the cost from the insurer to the patient, are ultimately based on full price. Coupons are false gifts. They may help a few people in the short term but only reinforce higher prices for others. To use a coupon usually also means surrendering personal medical information to the manufacturer which then gains a new marketing tool. Coupons and “free” samples give physicians an excuse not to look for better medical values. Ultimately we all pay collectively for medical services no matter who the insurer is as the money comes out of our taxes, our premiums, or our pockets. Insurance plans only shift the cost around. Rebates and other bizarre or hidden reimbursement models. As I remember, Medicaid was the first insurer to legally use the rebate pricing system for its drugs. When state Medicaid programs began to press the drug companies hard to match their lowest offered price to any other customer and began to set up preferred formularies and use other managed care approaches to steer doctors and patients to lower priced drugs, drug companies offered the rebate model. In exchange for allowing all brand name drugs to be available in Medicaid formularies, the companies would return a substantial rebate to the state. This ended up being a lot of money. However, any return of cash to the state was a false gain. The door was opened wide to whoever could market their drug most effectively. 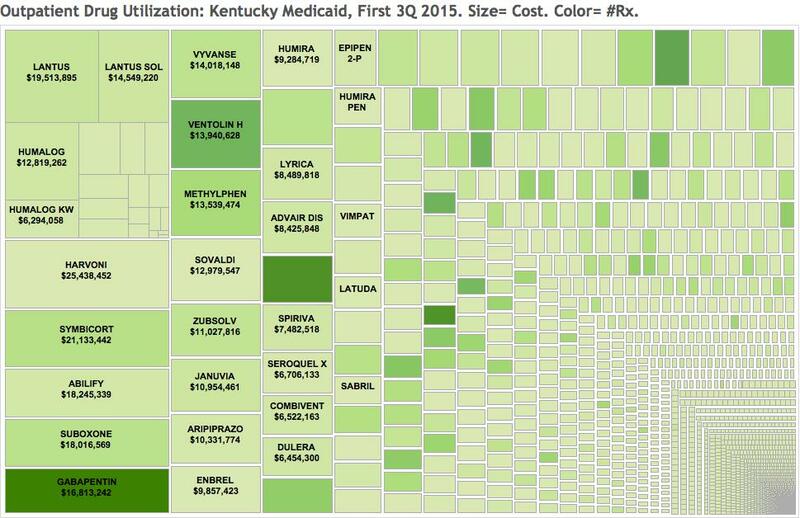 In Kentucky, the result was that its Medicaid drug expenditures soared exponentially. The rebate model has been adopted by the private pharmacy benefit managers (PBMs) that manage the drug plans of Part-D, Medicaid, and private insurance. (Originally these PBMs were much influenced by the pharmaceutical industry– and may still be for all I know.) However, it happens that the PBMs may choose not to return any rebates to the insurer but to use the rebates to add to their their own profit. This removes a most important incentive to promote and choose formulary drugs efficiently. It is noteworthy that Anthem, one of the major health insurance companies, is suing its PBM, Express Scripts, to recover alleged retained profits. Let me close here by opining that in the drug rebate world, I cannot easily differentiate a rebate from a kick-back or a bribe – or at the very least an inappropriate inducement. The end result is the same: expensive drugs get used when less expensive or generic drugs would have worked fine. Virtual impossibility of prospectively comparing prices. The bottom line for this article is that even after several hours scanning the internet, I do not have much feeling for comparative costs of day-to-day insulin use. It depends on package size, concentration of insulin in the vial or cartridge, whether pre-filled syringes or injector pens are included, or whether more than one type of insulin at a time is needed for good control. An authoritative-seeming source is at GoodRx. The human insulins listed are indeed only one third the price of insulin analogs, but it seems clear that yearly insulin costs must be in the thousands of dollars, not the seven or so hundred suggested in the New England Journal research letter mentioned above. To be honest, as a medical professional no longer involved in prescribing insulin, I am both confused and ignorant of how much a typical diabetic patient or their insurer is charged, or how much either actually pays. Perhaps someone will enlighten us. Nevertheless, there is no doubt whatsoever of the stunning impact of the cost of insulin on our public health insurance programs. Why is all this important. It is a truism that medicine that is unaffordable for a given patient and therefore not taken as prescribed cannot be not very effective. Reports from the trenches tell us that this is what is happening now. Short answer – me and you. It does not have to be this way. Diabetics in other countries pay much less than we do for their insulin. The governments of other industrialized countries protect their citizens better than ours does and yet they generally have have access to the same drugs we do. Modern highly purified versions of beef and pork insulin are available in at least some countries. Indeed, both animal-derived and human insulins can be smuggled in from Canada for personal use at much lower cost – but why should one have to? In my opinion, the high price of drugs in America represents a triumph of the lobbying efforts of and political contributions from the pharmaceutical industry. The industry has successfully captured and controlled the legislative and regulatory processes. Our elected legislators have been hornswoggled at best – or at worst been bought and paid for. It is not an accident that the Representative who shepherded the Medicare Part-D Drug plan through the House prohibiting our government from negotiating drug prices left office immediately to take a well-paid job with industry. Surely we do not deserve the healthcare system we have, but as long as we allow the priority of our interests to be placed at the bottom of somebody else’s list, what we have is all we are going to get. What will it take for us to begin to demand accountability from those we elect to represent us? How long will we allow the legal drug industry to ride rough-shod over us? For starters, a little transparency would go a long way to get things started. I have little doubt that I have not mentioned all the relevant issues above, or that I may have misrepresented others. Did I miss any insulins? Help me make a better argument. Let me know too if any of the links or the interactive data visualizations are not working. Previous Previous post: Who Paid UofL’s Legal Bills In Its Dispute With Norton Healthcare? Next Next post: UofL Board of Trustees Deemed Powerless, Left Hanging by Governor.